The Rising Sun School of T'ai Chi Ch'uan was founded in 1984 by Paul McCaughey, in Toronto, Ontario, Canada. We teach Yang Family T'ai Chi Ch'uan in the tradition of Master Lee Shiu Pak (1910 - 1982). Master Lee taught in Montreal, Quebec, from the early 1960's until 1982 when he passed away. Master Lee was a disciple of Chen Wei Ming of Shanghai, one of Yang Cheng Fu's senior disciples. The Rising Sun School is dedicated to the preservation of Master Lee's legacy. 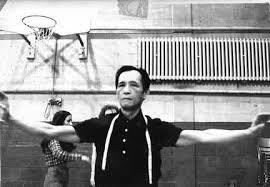 Master Lee Shiu Pak practicing his form in class at the Montreal Tai Chi Chuan Society. At its inception, The Rising Sun School was founded by Paul McCaughey to preserve Master Lee Shiu Pak’s work in Classical Yang Family Tai Chi. Master Lee Shiu Pak was a disciple of renowned Master Chen Wei Ming, studying with him for many years early in the 20th century, in Shanghai. After moving to Montreal, Lee Shiu Pak founded the Montreal Tai Chi Chuan Society, a vibrant group of Tai Chi practitioners who studied and supported each other through Master Lee’s philosophy of Tai Chi Family. Master Lee graduated many Instructors over the years, and of these, Paul McCaughey of Toronto and Sam Slutsky of Montreal remain active as teachers. From the beginning, Paul had a great love of teaching the art. Over 30 years, through his dedicated work and training, a Tai Chi Curriculum of study has developed that is remarkable both for its depth and accessibility. The Fundamental Level of training is much more than an introduction to Tai Chi. Paul says, “I have always believed that the essence of Tai Chi is already in each person. It is the instructor’s job to reveal that to the student, through helping them to develop their own natural balance and strength”. Graduation: After about six months you will graduate with your first stage in T’ai Chi, with both a practise and understanding that will allow you to learn the rest of the 86 movements with a depth and breadth that is not possible unless someone does the fundamentals with you right from the beginning. You will be a truly experienced practitioner and student at this point. Exercise: The Yang Family Long Form, Partnered Form, Sword , Broadsword, Cane and Staff Forms. Medicine: Acupressure Massage, Injury Treatment, Chinese Herbal Medicine for common maladies, and Dietary Energetics. Philosophy: Living a life that is characterized by inclusiveness, learning, helping oneself and others, and doing one's work in the world. We find that most people come to T'ai Chi for its Exercise aspect and yet also have some degree of interest in T'ai Chi's Eastern Philosophy of balance and harmony. Many prospective students of T'ai Chi are are not aware that by working in the Exercise aspect, they also practice aspects of Medicine (prevention of disease) and Boxing (each movement has its application to self-defense). In principle, the Four Aspects teaching is about the enormous value that a multi-dimensional viewing point can add to your study. How much of the entire Four Aspects Study a student may pursue will depend on the needs and disposition of that student. It is not uncommon for people to find extraordinary growth and balance by learning about the aspects they find the most challenging. For 'Healers' this is often the Boxing and for 'Boxers' this is often the Medicine, - not so surprising! Master Lee's 86 movement Yang Family Long Form was a beautiful fulfillment of over 40 years of practice and study. His movements were extended yet relaxed, his spine vertical, and each posture conveyed an impeccability of martial application, as well as health benefit. He was able to accomplish the difficult task of sinking and remaining soft while at full extension. His form exemplified unity in diversity, reflecting a precision of intent without loss of continuity. It is a rare gift to find and give yourself to a lifelong challenge, whether that be marriage, parenting, friendship, career, or T'ai Chi Ch'uan. When one gives themselves to T'ai Chi Ch'uan as a lifetime study, it becomes a continuous thread that is drawn through all the changes and challenges of life. T'ai Chi Ch'uan can be a mirror, a companion, and eventually an old friend. It can be where one's balance is reflected, and perhaps more importantly, where one's measure is cultivated.